Overcome the embarrassing problem of smelly feet, stinky feet. The FreshFeet exfoliates your feet naturally, to reduce foot odour. 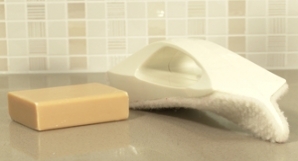 If you suffer with the embarrassment of smelly feet, the unique FreshFeet Exfoliator is the effective and natural new way to improve your basic foot hygiene quickly and easily. Just scrub the soles of your feet, and then in-between your toes with the ergonomically shaped FreshFeet. It cleans your feet and gently exfoliates the skin at the same time. Using the FreshFeet daily helps maintain ultra-clean healthy feet, improving your personal foot hygiene and greatly reducing foot odour. Why your feet need extra care - to exfoliate and reduce foot odour naturally. Your feet need the extra care of exfoliation using the FreshFeet personal foot cleaner because normal washing with a flannel, does not remove the daily build up of naturally occurring dead epidermis (skin) cells on the soles of your feet and in-between your toes. When your feet sweat, the bacteria (microbial flora) on your body starts to break down this mixture of sweat and dry, dead skin cells – creating an isovaleric acid with a highly pungent smell. This condition is medically termed as bromhidrosis or ‘foot odour’ (also commonly referred to as smelly feet or stinky feet.